Before last month I hadn’t been to Disneyland Paris for about 6 years so I didn’t really know what to expect when it came to meeting characters. I noticed a few things about meeting characters so I thought I would put a blog post together for anyone visiting soon. I know, I know! I shouldn’t compare Walt Disney World to Disneyland Paris. I am usually one of those people that agrees that they should each be loved for what they are and not compared. However, I couldn’t help myself from comparing the character meet and greet experience. In my opinion it was harder to find characters in Disneyland Paris than it ever has been in Walt Disney World. Whilst there are set locations to meet characters, I rarely seemed to be ‘in the right place at the right time’ to see characters. I am sure there are plenty of people who manage to meet lots of characters during their trip but I don’t think it would have been possible for us as we wanted to have a balance between rides and characters. There are often characters out and around the park that aren’t an organised meet. This means they don’t have organised queues which results in a huddle of people pushing to meet the character. I don’t think that it works having character meets this way as there is no way to possibly have a quality interaction with a character that allows time for an autograph and photograph as well. As far as I am aware there have always been meets that way as I remember it being that way even as a kid. The Photopass in Disneyland Paris is often criticised and to some extent I agree. During our stay there wasn’t always a Photopass photographer at the meet and greats which is a little disappointing considering the price of the pass. There were photographers at some of the meets though and since me and my friend split the cost of the Photopass I didn’t feel like too much of a waste – read all my thoughts on the Photopass here. The shops in Disneyland Paris had quite a good selection of different autograph books and pens and at a reasonable price. One thing that I noticed whilst meeting characters was that not many people had them. I purchased an autograph book and pen on the first day, mainly out of habit. I have always used autograph books on Disney trips but I noticed that less people had them this trip. Most people opted for the character interaction and a photograph instead. I did see one girl who asked the characters to sign a t-shirt which I thought was a great idea! I already have quite the collection of autograph books from previous years so I’m definitely going to look into some possible alternative autograph book ideas for Walt Disney World in October. If you want to meet the ‘fab five’ then I would definitely recommend staying in a Disney Hotel. There are often characters in the hotel lobby of the different Disney Hotels. As queues can be all kinds of crazy in the parks, meeting characters in the hotel is a great way to meet characters in a slightly quicker and organised way. Even the main mouse himself has been known to meet in some of the Disney Hotels. Staying on-site also gives you access to the all important Extra Magic Hours (EMH). During my stay Minnie Mouse, Chip and Dale, Donald Duck, Goofy and Pluto all had a character meet spot on Main Street USA in Disneyland Park. The queues weren’t significantly long during EMH, especially on the days we got there soon after EMH started. If you want to meet characters but don’t fancy waiting an hour just to meet Mickey Mouse, then I would definitely recommend Character Dining. I have only been to one of the dining experiences in Disneyland Paris but from experience in Walt Disney World I know that character dining is great fun. The only issue can be is that they are quite expensive especially for lunch/dinner and for families. We opted to go to Plaza Gardens for the character breakfast as it wasn’t overly expensive and they had the selection of characters that we preferred. I have written a full blog post on my experience at Plaza Gardens here. If there is a specific character that you would like to meet during your trip then head to City Hall. City Hall is located on the left hand side of Main Street USA as soon as you enter Disneyland Park, you won’t miss it! Once the park has officially opened you can go to City Hall and a cast member should be able to make a phone call to find out if your favourite character will be out at all during the day. We didn’t get chance to do this but next time I definitely will as I’ll want to meet Winnie the Pooh! You can also get free ‘I’m celebrating’ badges from City Hall. The first characters we met were Chip and Dale! I met Chip and Dale during Extra Magic Hours as we were staying in Disney’s Santa Fe Hotel. They had a meet and greet spot right in the entrance to the park and had a surprisingly short queue. We didn’t wait too long to meet them and it was definitely worth it as they are one of the best interactions. They are so fun and cheeky. I mainly interacted with Dale who seemed to like the pins on my lanyard and even made me dance with him 😂 Unfortunately this was one of the cases where there wasn’t a Photopass photographer. I gave the cast member my camera and she happily took photographs for us. I would have preferred there to be a Photopass Photographer though as they are such a greet meet. If you aren’t staying in a Disney resort then you can still see Chip and Dale. They have a meet and greet spot in Adventureland in Disneyland Park and they are also in the Mickey Presents: Happy Anniversary Disneyland Paris show as well as the parade. During Extra Magic Hours another day we met Minnie Mouse. Minnie Mouse had a meet and greet spot on the left hand side of Main Street USA next to The Storybook Store. 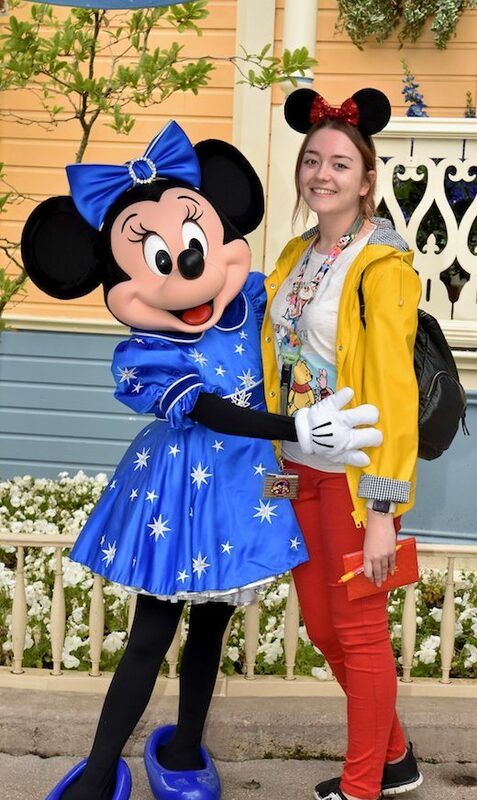 There was quite a queue to meet her so I would recommend going to the park for the beginning of EMH if you are planning on trying to meet characters, especially Minnie Mouse. The character interaction was great with Minnie and an added bonus was that there was a Photopass photographer! I was so glad we had the Photopass as they are some of my favourite photographs from the trip. 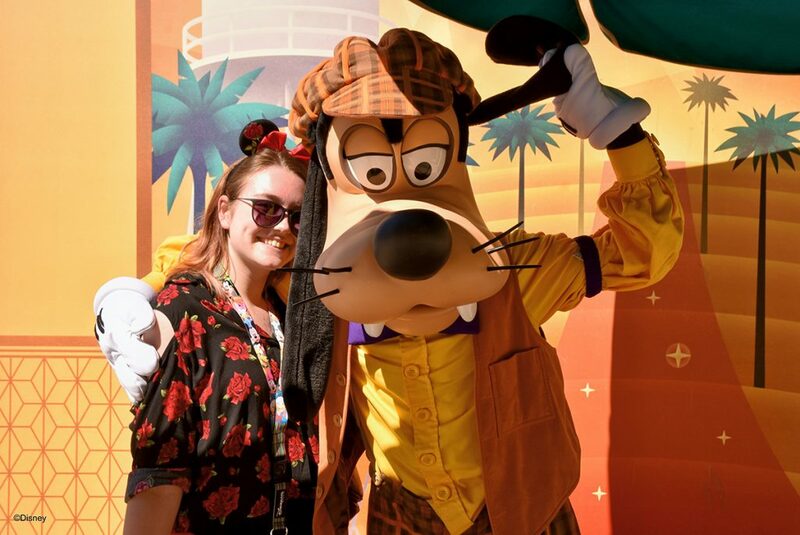 You can meet characters in and around both Disneyland Park and Walt Disney Studios during regular opening hours. We met Goofy in Walt Disney Studios one afternoon as we were leaving the park. He meets regularly in the same spot right in front of the park entrance. It was a very warm long day so they aren’t the best photos but I still love them all. The Photopass Photographer at the meet happily took a photo of us together and on our own. Another character we met is actually Jessie from Toy Story. We met Jessie in Adventureland in Disneyland Park. The meet and greet is behind Big Thunder Mountain and is labelled ‘Woody and Friends’ so it changes which Toy Story character you can meet there. We just happened to pass the area during a Jessie meet. There was hardly any queue which was great as it was so warm! There wasn’t a Photopass Photographer there unfortunately but the cast member there was amazing. He took plenty of photographs for us, which I love! As I mentioned before, another way to meet characters is a character meal. There are a range of character meals you can go but we decided to go to Plaza Gardens for the character breakfast. I have posted previously about my thoughts of the breakfast itself (from the point of view of a Nut Allergy sufferer) in this post. During the meal we got to meet 6 characters. I found that the amount of time to meet the characters was enough to have a good interaction, take a photograph and get an autograph. From a character meet point of view I would say it was worth the money. If you want to meet a few characters in a short space of time (and eat plenty!) then character meals are definitely for you!. The characters came round in two groups. First we met Eeyore, Piglet and Tigger. As a Winnie the Pooh fan, you can understand why I wanted to meet these characters! I was a little disappointed not to meet Winnie the Pooh himself there though, one more character wouldn’t have hurt surely? Eeyore was super cute! I absolutely love Eeyore, he was lovely to meet and I think we were both a little disappointed that he couldn’t sign my autograph book. I was especially disappointed as I have had autographs from Eeyore in the past so it is a shame not to have one from this trip. Piglet was another character who was unable to sign. Piglet was still a really cute meet though, we even matched a little as I was wearing my pink jeans and pink Minnie Ears. We then Met Tigger who was really fun to meet and was able to sign my autograph book. Next came the main mouse himself. Mickey Mouse. I’d say that Mickey Mouse is my all time favourite Disney character. I love Winnie the Pooh and Eeyore of course, but it all started with a mouse after all. I couldn’t even tell you how many different Mickey Mouse tops I have, I seem to be unable to resist them. I of course wore one of them to the character breakfast. The top that I wore is from Primark and cost £6. It is still available in quite a few Primark stores. I also wore some pins on my lanyard that day including my Mickey Mouse cast member pin. We also met Daisy Duck and Scrooge. I particularly liked meeting Daisy Duck, she has such a pretty outfit and her autograph is so cute!